No Contract Required - Ever! 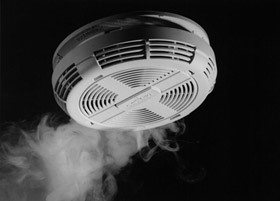 According to Atlanta’s Centers for Disease Control, over 2,500 people die every year in house fires. Many of these deaths could have been avoided if the homeowner had a functional smoke alarm monitoring system in their home. In addition to their lifesaving capabilities, there are several other great benefits of installing this type of system. Below is a look at some of these top benefits you will receive from installing a smoke alarm monitoring system in your home. One of the main benefits of having a smoke alarm monitoring system is that fact that emergency responders receive notification at the first sign of a fire. This may literally mean the difference between life and death. In addition, the earlier the fire department can get to your home, the less damage is likely to occur. The best benefit of installing this type of system is that your home will be protected 24/7, even if you are not home at the time the fire starts. This means that even if you are out for a few hours or away for a family vacation, the fire company will still receive contact immediately if there is a fire in your home. If you are not home when the smoke alarm monitoring system detects a fire in your home, you will receive instant notification through a text or email message. This will give you peace of mind when you are away, knowing that everything is fine back home. You do not have to worry about installing a complicated or hard-to-use smoke alarm monitoring system. Our smoke alarm systems come with a user-friendly touchscreen control pad that you can adjust at the touch of a button. You may also be able to control your monitoring system through your home computer or mobile device. Either way, alarm experts from Actio will help you understand how to use your smoke alarm system. A professional smoke alarm monitoring system will come with a backup power supply. This means that even if the power is out at your home, the system will still work properly. This can be an important feature during a severe storm in your area. Many insurance carriers offer substantial savings for homeowners who install a smoke alarm monitoring system in their home. Installation of a monitoring system is more affordable than most people think when you factor in this savings. You should check with your current insurance company to see how much you can save each year by installing a smoke alarm system. Most importantly, a smoke alarm system can give you peace of mind knowing that your family is protected in the event of a home emergency. Talk to our smoke alarm monitoring professionals today about how we can install and monitor the right smoke alarm system for your home or business! Rates start at $18 per month with no long term contracts. We use non-proprietary systems so you are not locked into our services. Home telephone connection not needed with our wireless monitoring services. When you call us you will talk to a real person. We do not use automated automated call or voicemail systems. We've serviced the Atlanta area for over 45 years, with three generations of history. Use the link below to access our secure online bill pay portal. Your personal and financial information is protected by 128-bit encryption by our payment processor. This will open a new, secure browser page.